Microsoft Office, the industry leading productivity suite, will be coming to Apple's iPad, as well as Android-based tablets, this November, a new rumor claims. Citing a "reliable source," Boy Genius Report said on Wednesday that Microsoft is planning to release the full Office suite for iPad later this year. The loading screen for the application reportedly says "Office for iOS," which could suggest that it will also be compatible with the iPhone and iPod touch. A version of Office for Android tablets will also reportedly debut in November alongside an iOS version. Other details on the software, such as pricing or features, remain unknown. Word first surfaced last November that Microsoft was working on an iOS version of its Office suite. It was also said that the Redmond, Wash., software company planned to release an updated version of Office for Mac on Apple's digital distribution Mac App Store. Word of Office for iPad appeared again this February, when iPad news publication The Daily shared what was said to be a version of Office for iPad in action. However, Microsoft quickly responded to the report and accompanying picture, portraying them as "based on inaccurate rumors and speculation." February's report suggested that a version of Office for iPad would "soon" be submitted to Apple for review, suggesting it would appear on the App Store relatively quickly. 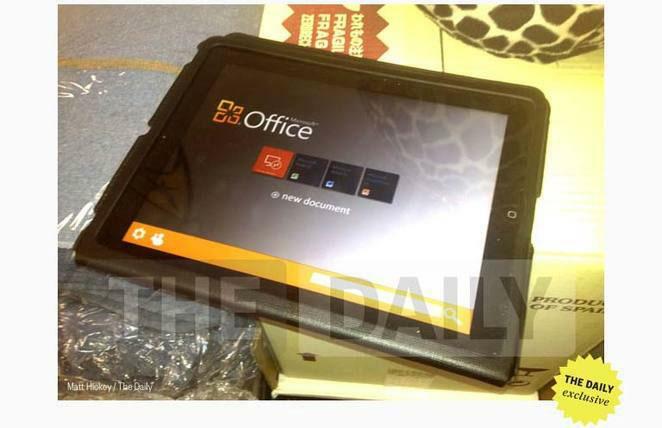 However, since then, no word of an Office for iPad has surfaced. That report also claimed that Word, Excel and PowerPoint files could be created and edited both locally and online with the iPad version of Office. It was reported as "unclear" whether Microsoft would support other Office applications, such as Outlook or Communicator. Microsoft already offers a number of software options for iOS, including OneNote, Bing, SkyDrive, My Xbox Live, and the game Kinectimals.